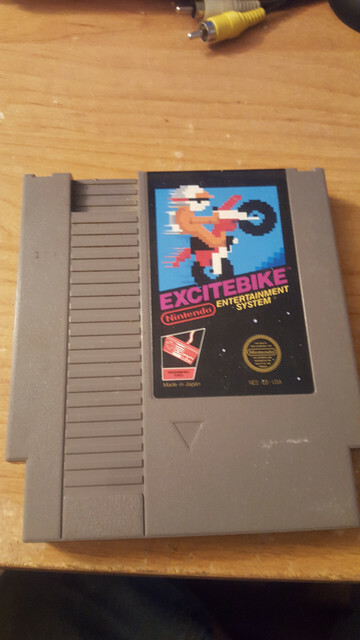 I was browsing through my collection and noticed something strange about one of my copies of excite bike. 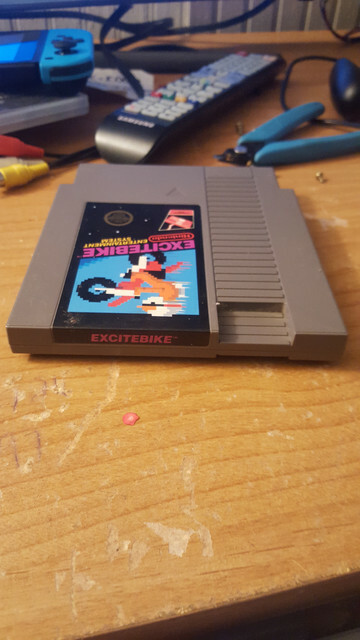 It does not have the tabs at the top of the cart like every other official nes game i own. also the label colors are a little brighter than the non-strange copy i own, Also the screws are not the standard security screws (they can be unscrewed with a flat head screwdriver). I have opened it up and it seems pretty standard as far as the board and components (I can take photos of the board if anyone requests). I also noticed that neither the front or back label have a date, see uploaded pictures. So does anyone have any clue? 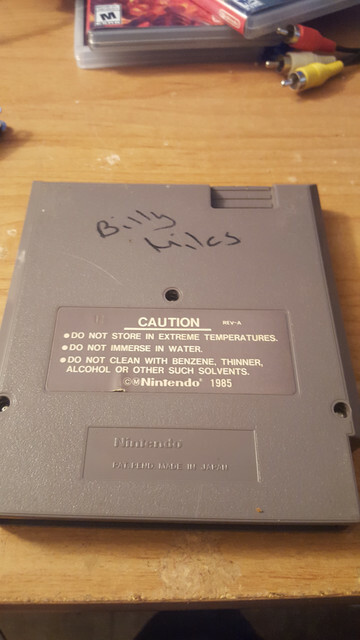 do i have a reproduction or a bootleg copy? You can spot the differences. let me know if you have any ideas. Also thanks Billy Miles for the copy of excite bike! 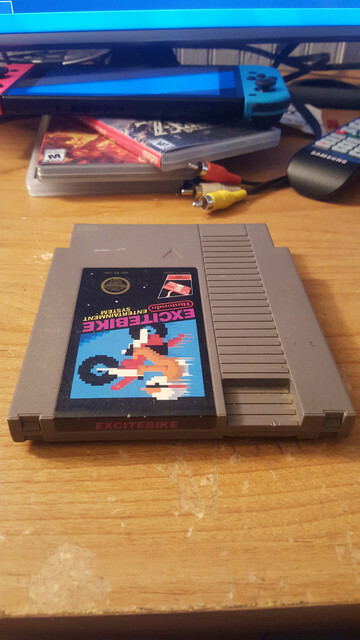 You have what is most likely a first-generation Excitebike cartridge that contains a Famicom-to-NES adapter inside of it (rephrased: the PCB/cart itself is a 60-pin Famicom cartridge, attached to a 60-to-72-pin adapter to make it work on the NES). These tend to sell for quite a lot of money (US$75 is common and what mine went for; it was of Stack-Up but that has no bearing). There are ways to tell this, but the easiest way is to simply open the cart up and look. 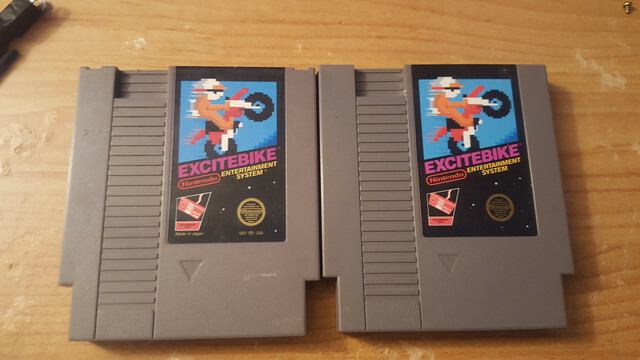 It's almost certainly not a bootleg (bootleg NES carts are much more uncommon than Famicom carts). 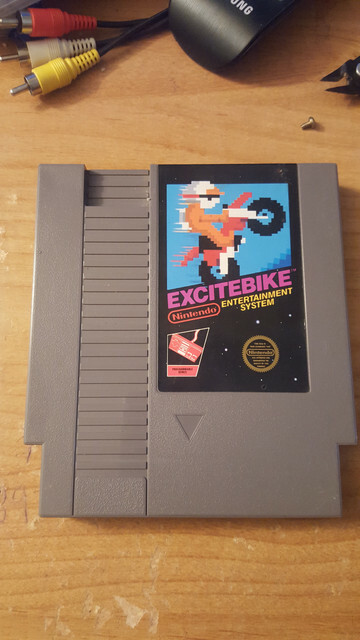 Nintendo also used different shells/cartridges for Excitebike and several other first-gen titles; some are 5-screw, some are 3-screw. Some (the very early originals) contained the Famicom 60-to-72-pin adapters I mentioned. 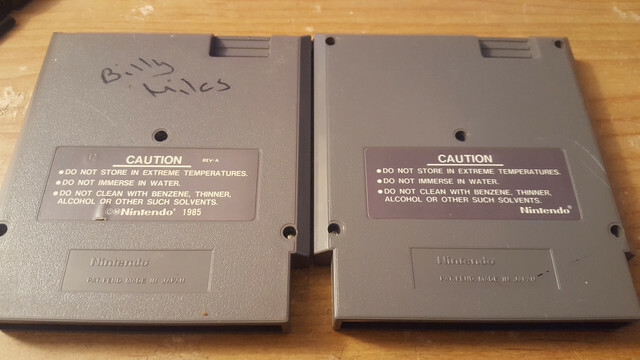 There's no difference between the cartridges otherwise; they're the same game. 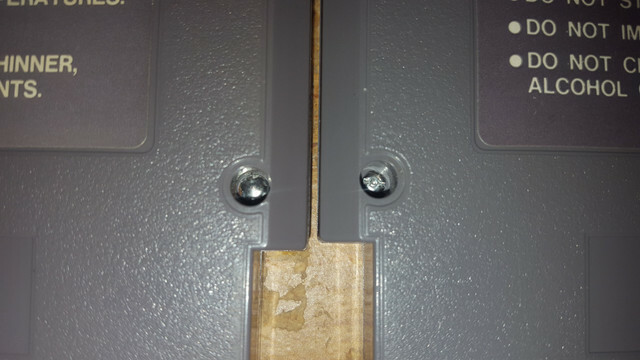 If you do have one that contains a Famicom 60-to-72-pin adapter in it: DO NOT disconnect the Famicom cartridge from the adapter without writing down which way/direction the cartridge was facing. 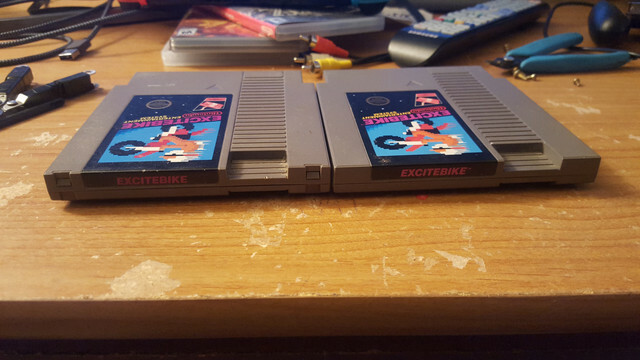 You CAN insert these cartridges into the adapters backwards (or the adapter into the NES backwards!) which will will cause damage (IIRC, permanently). On the one I sold, I actually used sticky labels on the adapter to indicate what was pin 1 and which was "front" vs. "back", to make it easier for the buyer to know how to use it. I might have pictures from an old backup if you want to see them. -- Edit: I checked, and I don't. It was eBay Auction #152476364390. Last edited by koitsu on Thu May 10, 2018 6:27 pm, edited 1 time in total. Thank you for the quick reply, I also thought it might have been a famicom to nes adapter version but i opened it and it was the standard 72 pin board inside. I found it strange that ive owned it for maybe 5 plus years and never noticed it was different. Ah I see. Yeah, it's not strange -- Nintendo used both "old style" (5-screw) and "newer style" (3-reverse-torx screw) shells for "older" games. It was during a transitional period during the tail end of first-generation launches. It's normal. Nothing unique there. Ah i see. Well Thank You Kindly for the info. I'd buy you a beer if i could, Thanks Again! Have A good one. 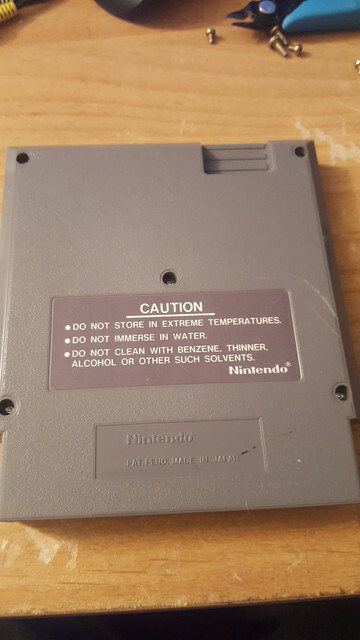 edit : HaHa I just looked through all my games again and i have a copy of 1942 thats the same except it has the copyright nintendo 1985 on the back label and NES-NF-USA under the official seal of quality on the front. By the way, apart from physical differences, there actually are a few games where even the game's code is different. If the type of the game is listed as PRG1 instead of PRG0, then the code was revised from its original version.